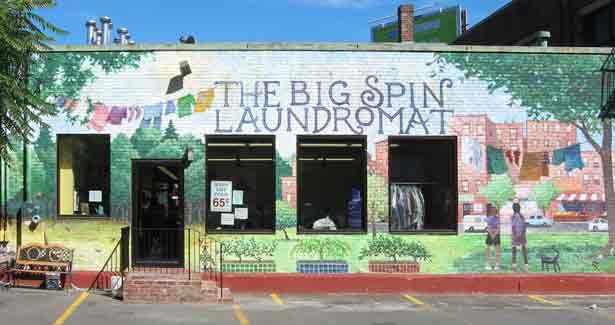 Too many Coin Laundry owners fail to focus on the large expanse of exterior space that is available to make their Coin Laundry unique and memorable. An exterior mural can help bring art to the neighborhood, and actually enhance the memory of your store. Murals have been used for a long time inside Coin Laundries, but recently fairly beautiful original artworks has found it's way to the exterior of buildings. It's the type of item that makes children urge their parents to return to the Coin Laundry "with the peacock on the side, mommy." Cost can range from a few hundred to a few thousand depending on the size, detail and skill of the artist. Some of the best mural paintings come from the brush of Los Angeles artist Allyson Jones Wong, Cellphone: 626-798-3077. She is highly recommended because she is talented, has reasonable prices and is skilled at interior murals as well. Some of her very good work is in Mexican Heritage pieces that are fun, entertaining and reflective of many customer bases. The artist, for an additional cost, can have a graffiti protection paint - clear paint put over the mural - on the entire design, although it is the experience of most owners that murals depicting the heritage of the customer base are seldom the object of graffiti attack. It makes your Coin Laundry unique. Consider it for your store. Labels: Coin Laundry decorations, Coin Laundry murals, Coin Laundry paintings.